When my son was young, his birthday was coming up the next day. As a busy mom and owner of A Chef of Your Own, all I wanted to do, was buy cupcakes from the local grocery. I asked him if that would be ok or did “I have to make them” He told me I had to make them. When I asked him why, he said “because you put love in them.” Well, I made the cupcakes. Today I am putting love in a cake again and making home made buttercream and marshmallow fondant. This recipe comes from the wilton web page. To make marshmallow fondant, place marshmallows and 2 tablespoons of water in a microwave-safe bowl. Microwave 30 seconds on high; stir until mixed well. Continue microwaving 30 seconds more; stir again. Continue until melted (about 2 1/2 minutes). Place 3/4 of the confectioners’ sugar on top of the melted marshmallow mixture. Fold sugar into marshmallow mixture. Flavoring can be added at this point if desired. Place solid vegetable shortening in easily accessed bowl so you can reach into it with fingers as you are working. Grease hands and counter GENEROUSLY; turn marshmallow mixture onto counter. Start kneading like you would dough. Continue kneading, adding additional confectioners’ sugar and re-greasing hands and counter so the fondant doesn’t stick. If the marshmallow fondant is tearing easily, it is too dry; add water (about 1/2 tablespoon at a time) kneading until fondant forms a firm, smooth elastic ball that will stretch without tearing, about 8 minutes. It’s best to allow Marshmallow Fondant to sit, double-wrapped, overnight. Prepare the fondant for storing by coating with a thin layer of solid vegetable shortening, wrap in plastic wrap and then place in resealable bag. Squeeze out as much air as possible. Marshmallow Fondant will keep well in refrigerator for several weeks. To color fondant: If you need to tint the entire batch of fondant, add a little icing color to the melted marshmallow mixture before adding confectioners’ sugar. For smaller amounts of tinted fondant, add icing color to portions of fondant as needed. A Chef of Your Own worked with a Rabbi this week to create some meals for Passover. My aunt sent me an article on “the new Kosher Foods” they had some Red Velvet Macaroons in the article, but no recipe. I went looking and found one to adapt for these. As an homage to Passover, I didn’t use any flour but you can substitute flour for the ground almonds I used. Here’s a recipe for a good friend in honor of the green. Mix together first 7 ingredients (I omit caraway seeds, because I don’t like them). Beat together wet ingredients and add to dry. Kneed 1 minutes. Dough will be sticky. Place in greased cast iron pan (10inch) (I have also baked this on a cookie sheet, the crust doesn’t get as thick) Cut a cross in dough before baking. Bake in 350 degree oven for 35-35 minutes until straw inserted comes out clean. A Chef of Your Own found this recipe on Facebook, on Living the Country Life page. They looked so yummy, I couldn’t resist making them for breakfast. They were a little messy, but I added plenty of love to make up for it. Directions: To make the Cinnamon Filling: Mix the three ingredients together. Place in a disposable piping bag and snip the end off or put in a Ziploc bag and snip the corner off. To make the Pancakes: Mix the dry ingredients in one bowl and the wet ingredients in another bowl. Stir them together until everything is moistened leaving a few lumps. Heat your griddle to exactly 325 degrees. You don’t want these to cook too quickly, and you won’t want your cinnamon to burn. Make desired size pancake on greased griddle and then using the piping bag and starting at the center of the pancake, create a cinnamon swirl. Wait until the pancake has lots of bubble before you try to turn it. You will find that when you turn it the cinnamon swirl will melt. 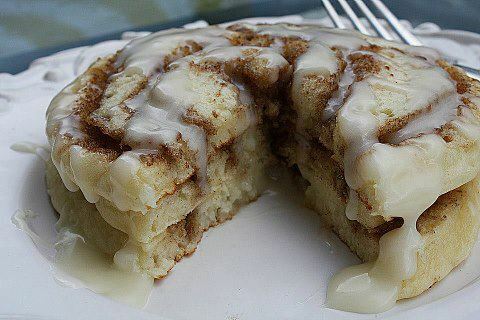 The cinnamon will melt out and create the craters which the cream cheese glaze will fill. To make the Cream Cheese Glaze: In a microwave safe bowl melt the butter and cream cheese and then stir together. Whisk in the powdered sugar and vanilla. Add a little milk if needed to make it a glaze consistency. Place pancake on plate, then cover with cream cheese glaze. A Chef of Your Own will be at The Fresh Market in Dr Phillips this Saturday for two demos. I will be making and sharing Chocolate Shop Wine Sauce Fondue and Shaved Fennel and Grapefruit Salad from 11-2 and Shrimp Scampi from 3-6. Please stop by for a taste and a chat, I will have the Chocolate Shop Wine and Alamos Chardonnay out for a taste as well. Hope to see you there. Place first 4 ingredients into a saucepan on low heat. Stir constantly until melted and thoroughly combined. Keep warm on very low heat or pour into fondue pot. Enjoy by dipping strawberries and pound cake cubes in sauce using long toothpicks or fondue forks. A Chef of Your Own is always looking for fun recipes to share with their villa guests. I found one in the newest magazine from America’s Test Kitchen, Home made Tater tots. Here is the link to the test kitchen site. http://www.cookscountry.com/videos/detail/41127 I will be making these again.